Virginia Tech was the only team to beat Ohio State last season. See how Coach Bud Foster and his defensive staff took a chance against the Buckeyes and it paid off. He had to defend a dual-threat quarterback in the run game. And be sound enough in his coverage to handle the lethal play-action pass game that complemented it. Coach Foster had to find a way to morph the Hokies traditional 4-2-5 structure to protect more gaps at the line of scrimmage, the Buckeyes’ offensive line were consistently getting second level linebackers blocked. A six-man box wouldn’t do, he needed to get a seventh defender in there to take the quarterback away in the read option game. But adding a seventh defender could only mean one thing: pure man coverage on the back end. So, he put in a Bear package, which blended some of Buddy Ryan’s 46 defense principles with what Foster was using with his free safety who can be both an extra player in the run and pass. Best part about it is he didn’t even need to change his 4-2-5 personnel to do it. Hokies wound up utilizing the Bear on 54 of 74 total snaps against the Buckeyes holding them to a season-low 108 yards on the ground and causing three interceptions. The final interception came on a pick six to deal the future national champions their first and only loss of the season. This concept not only became the blueprint for beating Ohio State, but it worked so well it became a fixture for first and second down defense against one-back teams such as Duke, East Carolina and Virginia. 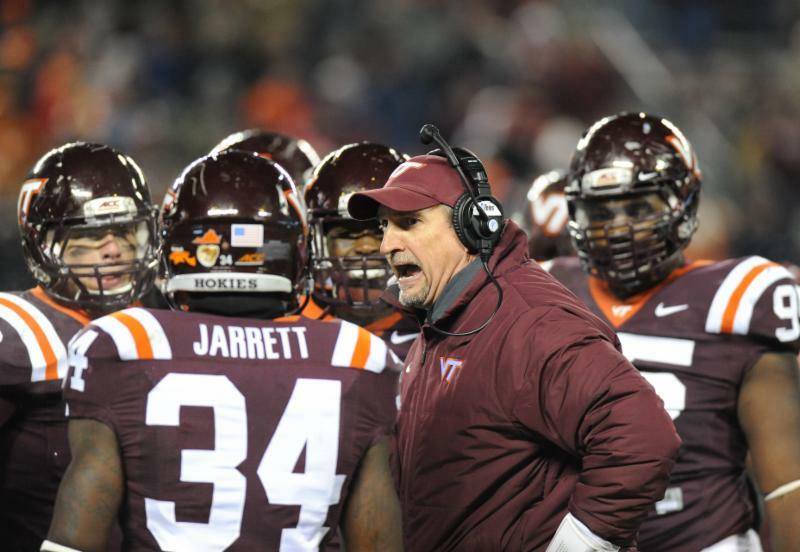 The Hokies utilized it on 22 percent of all their defensive snaps last season. Its efficiency was through the charts; the Hokies allowed less than three yards per carry using Bear, often putting its opponents behind the sticks on first and second down. Provides a +1 run filter against one-back QB option runs such as the Zone Read and Power Read games. 5-down front structure that negates any combination blocks at the point of attack used in Zone and Gap blocking schemes. Easy transition from 4-2-5 defensive structure to 5-down without changing personnel groupings. Coverage structure that is sound against play-action concepts by utilizing combination coverages in the backend depending on formation. Hokies’ A.F.C. (automatic front and coverage check) this spring to Y-Off or sniffer formations made synonymous by Ohio State. Used by Virginia Tech on 22% of snaps this season (54 against Ohio State) to get offenses behind the sticks on first and second down. X&O Labs’ Senior Research Manager Mike Kuchar spent three days in Blacksburg this spring researching Virginia Tech’s Bear package. And, no, he wasn’t hiding in the bushes or going through the Hokies’ trash to get the skinny. Kuchar was the guest of Coach Foster, who agreed to the “put-it-all-on-the-table” set of meetings. We wanted to find out from Coach Foster how his Bear package could help other defenses, specifically those who run a 4-2-5, who defend the quarterback run game on a week-in, week-out basis. Kuchar spent hours with Foster and his defensive staff analyzing over 196 clips of the Bear package, peppering him with questions - lots of questions. Foster was revealing in this report, expounding upon how he defended sniffer formations, unbalanced X-off formations and the run concepts that are synonymous with them: Power Read, Speed Sweep, Split Zone Read, etc. This is all first-hand information presented in a way that only X&O Labs can present - accurate and detail heavy. We call this brand-new special report: Virginia Tech’s Bear Package. This report is available right now in X&O Labs’ exclusive membership website, Insiders. As you can image, we were able to gather a large amount of information from Kuchar’s three day stay in Blacksburg. So we decided to present all of his findings in three cases. In case one, we report on the specific personnel that Foster uses in his Bear package and how he transitions his “G” front into Bear pre-snap based off the offensive formation. We detail the advantages of using the Bear package, particularly against one-back option offenses. We report on how it can give you +1 in the run game to defend multi-faceted quarterbacks, while providing adequate run support on the perimeter. We present on the “cheat post” technique of the free safety, which allows you to get an extra defender in both the run and pass based off trigger keys. How reducing a defensive end into a 3-techique can be more productive than making a personnel change. Why the nose doesn’t need to be a two-gap defender and how Coach Foster ties him into the fit. How Coach Foster cross trains his weak side linebacker to be a boundary defensive end in this structure. Why your Mike linebacker can be the centerpiece of the scheme, who is able to make plays from sideline-to-sideline. How the Bear package aligns against 2×2 and 3×1 open and closed formations including the Y-off formation, unbalanced X-off formation and empty. How the Rover and free safety can be interchangeable based on their distinct abilities. The Eagle adjustment that Coach Foster used to defend two-back unbalanced formations that Ohio State frequented. This is where it gets juicy (and by “juicy” we mean… it gives you the “what” and a whole lot of “why”). In this case, our research presents how much of an emphasis Bud Foster places on anticipating which run schemes he will get based off film study and preparation. We detail the pre-snap level read progression Foster teaches his second and third level defenders based on the placement of the back. We detail the run fits of each defender against every run concept presented in one-back formations including the post-snap movements designed to get an advantage on these concepts. An explanation of the three-level reads off the single back, which play concepts are anticipated and how it can change the post-snap reads of the first and second level defenders. How these rules apply to Pistol and sniffer formations. Explanation of the Spark technique used by the nose. The “pad back” technique used by the read side 3-technique to protect the tailback wind back in Zone Read schemes. How the play of the defensive end/backer changes against Speed Option and Read Option concepts. Explanation of the “high gear” technique Coach Foster uses to teach the backer/defensive end to defend Speed Sweep run concepts. The “Jolt” pre-snap movement that Coach Foster uses to transition from his 4-2-5 front to his Bear front. The “Take” post-snap movement that Coach Foster uses against wide-split teams like East Carolina. The “Smash” post-snap movement that Coach Foster uses against zone run teams that try to rewind the back side guard on the 3-technique. The “Spill” post-snap movement that Coach Foster uses when offenses are making it difficult to decipher the level of the back. The run fits of the Mike linebacker and how it changes based on: the level of the back and the run surface presented by the offensive formation, including how he fits off the run concepts used in the Y-off formation. The “cheat post” technique used by the +1 fitter in the run game at the third level and the keys Coach Foster uses to trigger him to become an extra player for the quarterback. Plus coaches game film on all these concepts. While it may be true that the Bear scheme is mainly used to stop the run game on first and second down, Coach Foster had found ways to tweak it to be effective against the pass as well. The Hokies used Bear last season against such pass-happy offenses like East Carolina, Virginia and Western Michigan. We present our research on the five main coverages Virginia Tech will utilize with the Bear package. The three different press techniques (including the Revis Technique) that defensive backs coach Torrian Gray teaches his corners and safeties and in which circumstances he uses them. An analysis of Cover 6, the Hokies base coverage in Bear, including player responsibilities and the adjustments made to 2×2, 3×1 and Y-off formations. An analysis of Cover 6 Free, including player responsibilities and the adjustments made to 2×2, 3×1 and Y-off formations. The “Three-Way Coverage” scheme Coach Foster uses to tie the edge players and the Mike with the release of the back. An analysis of Combo Coverage, the Hokies base adjustment to 3×1 sets, including player responsibilities and how the Rover is used to track the sniffer in open sets. An analysis of Key 9 Coverage, another variation of how the Hokies defend 3×1 sets including player responsibilities and why he uses it to defend perimeter run and pass concepts. The primary coverage Virginia Tech uses in the red zone with its Bear package and how Coach Foster ties the Free Safety into the fit against zone option. VIDEO: Plus, this brand-new special report, Virginia Tech’s Bear Package, includes over 50 minutes of game film provided by Coach Foster. So now, you’ll be able to read about the concepts, see the diagrams and then watch the concepts in real-game situations. Most of these clips show both the correct way to run the concept and the incorrect way – so you’ll get additional coaching points when implementing in your defense. The full special report, Virginia Tech’s Bear Package, is available right now in X&O Labs’ exclusive membership website, Insiders. Join X&O Labs’ Insiders. Go Here. If you are already an Insiders member, login here. When you join the Insiders you’ll be part of the fastest growing community of football coaches in the world. Over 6,000 football coaches and programs have already joined. Cincinnati and coaches in all 50 U.S. states and as far away as the Slovak Republic. In just a second, you can sign up and start your 12-month membership to the Insiders website. But first, you need to know two important things about the Insiders. Affordable Prices: First, because we’re coaches, we wanted to make the Insiders one of the most affordable coaching resources you’ll find anywhere. You’ll spend more on dinner out with your family than you will on your 12-month Insiders membership. That’s less than the cost of attending just one coaching clinic. And today, you get instant access to all this information for one affordable price. Money-Back Guarantee: Now the second thing you need to know is that we offer a full, 90-day money back guarantee. If at any time during your first 90-days you feel the Insiders is NOT worth your membership fee, just email us and we’ll refund 100% of your money. It only takes about 2-minutes. You’ll get a username and password – then you just login and get started. And if you ever lose your username or password, we’ll send you a new one in a few seconds. The best part is you can access the Insiders website anywhere in the world – and on any Internet connected device you want – laptops, desktops, tablets, smart phones. If it’s connected to the Internet, you have access to the Insiders. Click the big orange button below now to start your Individual or Staff Membership and get instant access to all of our special reports, research reports, interviews, clinic reports, drill reports and our massive video library for less than $4 per month. And with our 90-day money-back guarantee, you literally have nothing to lose.